Opening Night of 10th Planet Van Nuys! January 31st is a night that will forever live in infamy. To truly understand the importance of this day let me give you a little back story. 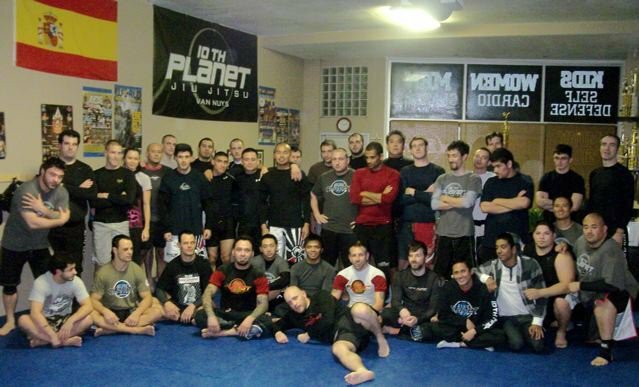 10th Planet Van Nuys opened it’s doors on August 24, 2010 to a packed class. From the moment the doors opened you could tell that this 10th Planet Moon was going to be a great addition to the 10th Planet family. On the very first night of instruction we already had special guests. That night future 10th Planet Black Belts Shigeki Matsuda and Brent Littell were in attendance to offer their support and share some of their knowledge. Everyone left that night knowing that something special was born. January 31st…The night we got our blues! Fast forward a few weeks and the race was already on to see who would be the first to receive their blue belt. Coach Alder laid out a challenge for a few us. Compete in the Gracie Nationals and the next night when Eddie Bravo was in the house we would get our blue belts! Of course a few of us immediately signed up for the Nationals and did our best. The very next night, January 31st to be exact, the moment had finally come. 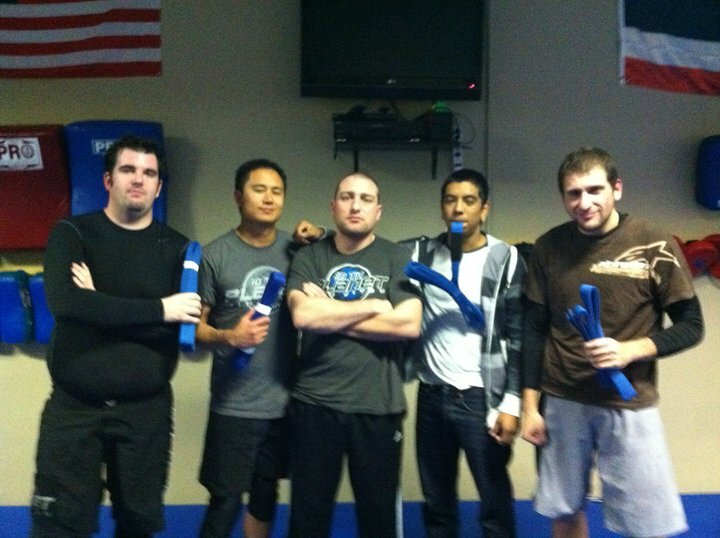 After long hours on the mat of drilling, rolling, and learning technique Michael “Lobes” Frausto, Mike “Tipz” Venturella, Jay “Messiah” Dimacali, and myself were given our Blue Belts. It was an amazing moment that was made even better by what would happen next. If you look closely you will see a rare sight. Master Laranja not wearing his gi! As we were celebrating 10th Planet Black Belt Sean Bollinger was on the mat prepping for his upcoming MMA fight. Out of nowhere that familiar music hit and Renato Laranja himself stepped onto our mats. It was breath taking. I couldn’t believe that the 27 time Mundial champ himself was standing on the same mat as me. Turns out Master Renato was there to help Sean with his upcoming fight. As we all sat there staring in awe Mr. Laranja himself taught Sean how to preform a collar less collar choke and dominate an opponent even if “Datch Guy He No Wear Da Gi”. It was a true honor to witness the master himself pass on his knowledge. Not to take anything away from Sean but I will point out that he won that fight via submission. Bummed you couldn’t be there that night? Well don’t fret my friends. This whole ordeal can be seen in Eddie Bravo’s Mastering the System Episode 18. If you would like to learn more about this infamous night feel free to stop by 10th Planet Van Nuys! You never know when Uncle Renato will show up!